Since its first session in 1863, the Legislature has endured many changes, from drastic change in the number of legislative members to the complete rewriting of the West Virginia Constitution in 1872. However, the basic principles and ideals are still very much alive. 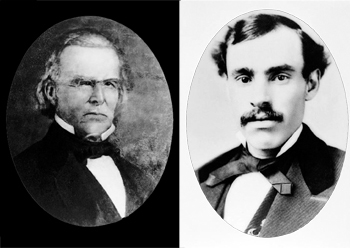 Members of the 1st West Virginia Legislature met June 20, 1863 at Linsly Institute in Wheeling to begin the newly formed state’s legislative session. As directed by the adoption of the first West Virginia Constitution in 1862, 20 Senators were elected from the state’s 10 districts and 51 members of the House of Delegates were elected. Senators were to serve two-year staggered terms while the House served one-year terms. Some of those who were elected to the Legislature served as Delegates during the Wheeling Convention, which set in motion the secession of West Virginia. Each member, under the Constitution, was compensated no more than $3 per day and 10 cents for every mile they traveled. The only exceptions to this were the Speaker and the President who were paid an extra $2 per day. According to the 1863 Acts, the Legislature appropriated $10,000 for the entire session. After swearing in the state’s first governor, Arthur I. Boreman, the House and Senate moved to the next order of business, which was to elect officers. The House unanimously elected 70 year-old Dr. Spicer Patrick, a Republican from Kanawha County, to serve as the state’s first Speaker of the House. The Senate, after three votes taken, elected John M. Phelps, a Republican from Mason County, as Senate President. Other positions filled during the first day of session by both chambers were House and Senate Clerks, Sergeant at Arms, doorkeepers and janitors. Both the Speaker and the President appointed two pages. Unlike today, pages then were teenagers or adults who were paid for their services. After all officers of both bodies were elected, it was time to move onto the next order of business, which was the adoption of rules. Since this was the first meeting of a newly formed state, the West Virginia Legislature adopted the rules from the last Virginia House and Senate meeting. The 1863 Journal records the Legislature requested the governor to ask other states for copies of their statutes. The first House Bill introduced related to the powers and duties of the Recorder. In the Senate, the first bill introduced would choose Commissioners of Emigration. One bill that was passed during the session defrayed the expenses of removing sick and wounded soldiers from hospitals and returning them back to West Virginia if the soldier or their family could not afford to do so on their own. Two other bills would admit Berkeley and Jefferson counties into West Virginia. A total of 204 bills passed both chambers when the Legislature adjourned Sine Die on December 11, 1863. One month later, the 2nd West Virginia Legislature would convene but this time they would adjourn after 45 days as was written in the West Virginia’s first Constitution. Numerous committees were also created, such as Elections and Privileges, Military Affairs, Forfeited and Unappropriated Lands, Claims and Grievances, and Humane and Criminal Institutions. There was also a committee on Seals, which would hire an artist to design the state’s official state seal. That honor went to Joseph H. Dis Debar, who would later serve in the House of Delegates. The 1st West Virginia Legislature not only passed the state’s first bills but also received reports from various agencies on topics such as the navigation of the Ohio River and the building progression of the lunatic asylum in Weston. Nine years later, in 1872, the Legislature would have its hands full once again as it was voted upon by the citizens of West Virginia to write a new, and the last, state Constitution. Noted author David C. McCullough said, “History is a guide to navigation in perilous times. History is who we are and why we are the way we are.” It is important to remember West Virginia’s 1st Legislature and how they built the foundation to the state’s legislative process. House Bill 2418 would include information pertaining to the operation, staffing, equipping or escape and emergency contingency plans relating to any jail or correctional facility as exempt from under the Freedom of Information Act if the release of information would jeopardize the safe, secure and orderly operation of a jail or correctional facility. House Bill 2694 would establish certain requirements for modification of custodial rights for parent’s or guardian’s that have been deployed to the United States Armed Forces. It would require that any such order is only a temporary order. It would allow the review of the temporary order to take precedence, shift the burden of proof to the non-deploying parent or guardian for a final order and set forth definitions. House Bill 2738 would allow protective orders to be registered with the West Virginia Supreme Court of Appeals to be entered into the Domestic Violence Database. By January 1, 2010, a petitioner who obtains a protective order may register that order with the West Virginia Supreme Court of Appeals for entry in the domestic violence database. House Bill 2834 would cap the amount of a PROMISE scholarship annual award at less than the cost of tuition at a state institution of higher education or $4500 for students receiving a PROMISE scholarship. It would end the PROMISE Board, transferring its powers to the Higher Education Policy Commission, and reconstituting the Financial Aid Advisory Board. House Bill 2835 would require state, local, county or regional development or redevelopment authorities to develop a master land use plan. It would require the Office of Coalfield Community Development to assist with the development of a master land use plan, upon request. It would require the Office of Coalfield Community Development to review master land use plans and would require the post-mining land use proposed in a reclamation plan to correspond with the associated master land use plan. House Bill 2843 would define a commercial dog breeder as any person who maintains 20 or more adult dogs for the purpose of the sale of their offspring as companion animals. The bill would require a commercial dog breeder to obtain a valid business license. The bill provides limitations for how many dogs a commercial dog breeder can maintain; when a commercial dog breeder may breed female dogs; how a commercial dog breeder may dispose of dogs; and would require them to maintain records of animal sales, purchases, breeding history and veterinary care. The bill would further provide that the Commissioner of Agriculture, any consulting veterinarians or any animal control officer may inspect the facilities of a commercial dog breeder. The bill would also provide that any violation of this section would be a misdemeanor subject to a fine of not more than $2,500 or a jail term of not more than one year or both. House Bill 2883 would prohibit employers and labor unions from requiring employees to become or remain members of labor unions as a condition of employment. House Bill 2891 would phase in requirements for electric providers to add renewable energy systems to help protect and sustain the environment. House Bill 2894 would provide individual and commercial users of the West Virginia Turnpike with a tax credit. The bill would provide individuals with a maximum $300 tax credit and residents of Fayette, Greenbrier, Kanawha, McDowell, Mercer, Monroe, Raleigh, Summers and Wyoming counties with a presumptive $25 credit. The bill would also provide commercial users with a maximum tax credit of $1,500. The bill would additionally provide for a full credit for individuals for the cost incurred in purchasing a West Virginia Parkways Economic Development and Authority PAC card. To the extent that the total tolls paid by the taxpayer exceeds the maximum credit allowed, the taxpayer would also be able to deduct the excess as an ordinary business expense. House Bill 2897 would authorize insurance to married workers without children at reduced rates under the West Virginia Public Employees Insurance Act. House Bill 2900 would create the West Virginia Transportation Infrastructure Bank. The purpose of the bank would be to provide loans and other financial assistance to government units for transportation infrastructure. Since adequate transportation facilities are an important element for continuing economic growth and development and financing methods cannot generate the resources necessary to fund transportation facilities, loans and other financial assistance to government units can play a part. The bill would provide an instrument to secure additional funding. House Bill 2915 would authorize the sale of prohibited fireworks; the bill would require the sales tax on fireworks be 10 percent; and would establish a special fund that distributes the firework sales tax proceeds equally to each West Virginia volunteer fire department. House Bill 2917 would include bicycle, pedestrian and transit ways in consideration in the planning, development and redevelopment of state roads, railways and waterways. It provides that bicycle, pedestrian and transit ways shall be established in conjunction with the construction, reconstruction or other changes of any state road, rail bed or transit way, with special emphasis to projects in or within five miles of an urban area or rural municipality. House Bill 2925 would add “sexual orientation” to the categories covered by the Human Rights Act, prohibiting discrimination in employment and places of public accommodations. This bill would also add “age” to the categories covered by the Fair Housing Act prohibiting discrimination in housing. House Bill 2932 would require the approval of board of health rules relating to tobacco use in public or private places. Senate Bill 99 would allow a circuit judge discretion to impose the original sentence on a youthful offender who has successfully completed a training program but who has been charged with committing another crime between his or her release from the offender center and the sentencing hearing. The offender would still get credit for time spent at the center. Senate Bill 239 would allow the voters to decide by a majority vote on the proposal of determining the option of a metro government in counties with a population exceeding 150,000 and containing a Class I municipality. It would be decided by a majority of voters of the principle city and a majority of voters of the county, excluding the principle city. Senate Bill 341 would transfer the authority to administer the juvenile justice database from the Department of Military Affairs and Public Safety to the West Virginia Supreme Court of Appeals. The court would grant the Division of Criminal Justice Services access to confidential juvenile records for the purpose of collection and analysis. Senate Bill 307 would establish an advisory council on maternal risk assessment within the Office of Maternal, Child and Family Health and would grant legislative rule-making authority to the Department of Health and Human Resources to develop a uniform maternal risk screening tool that would serve as an alert to medical care providers of the need for greater evaluation and assessment of high-risk pregnancies. Senate Bill 380 would provide a taxpayer with a qualified child or children a tax credit that would equal 20 percent of the taxpayer’s federal earned income credit. Those who qualify to receive the tax credit would be informed every year. Senate Bill 386 would authorize the State Board of Education to adopt reading, language arts and mathematics proficiency standards for students in grades three and eight. It would create critical skills instructional support programs for students who do not meet proficiency standards established by the state board. It would also provide for the retention of students who do not meet the proficiency standards and who do not successfully complete a critical skills instructional support program. Senate Bill 388 would provide a full tax deduction for the purchase of a new automobile in the tax year 2009. This bill would provide an exemption from the sales tax for the purchase of a new vehicle in the tax year 2009, and provide a sales tax holiday for fuel efficient vehicles every year after 2009. Senate Bill 395 would provide penalties if a person fails to make a reasonable, good faith attempt to return a minor child in a timely manner at the expiration of a lawful custodial time or visitation period. These penalties would also apply to persons who attempt to conceal a minor child or assist in the concealment of the child. Senate Bill 396 would authorize and regulate the sequestration and storage of carbon dioxide and to clarify the issue of pore space ownership. Senate Bill 399 would create a senior resident lifetime hunting, fishing and trapping license that will cost $15. Persons who are 65 years of age before January 1, 2010 would remain exempt from the purchase of the license. Senate Bill 401 would consolidate and combine all gambling related functions, the State Athletic Commission, and the Alcohol Beverages Control Administration within the Department of Revenue. The consolidation would create the State Gaming and Alcohol Commission. Senate Bill 412 would create the Governor’s Office of Health Enhancement and Lifestyle Planning to oversee coordination of state departments, agencies, bureaus and commissions for the purpose of redesigning health system delivery services in West Virginia. Senate Bill 416 would increase the salaries of family court judges from $82,500 to $111,000 beginning on July 1, 2009. Senate Bill 419 would create a Healthy Lifestyles Restaurant Calorie Posting Program. It would require certain food service establishments to post caloric information at the point of purchase. Senate Bill 426 would require certain medical providers to accept Tricare Military Insurance. Senate Bill 427 would clarify that the Board of Medicine is an autonomous board, which may hire employees at its will and pleasure. The bill would allow the Board of Medicine to determine the qualifications of applicants for licenses to practice as a physician assistant for a licensed physician. Senate Bill 432 would redefine the ability of Class I and Class II cities to terminate law-enforcement officers prior to the end of their probationary period. After the completion of the probationary period persons would have the right to appeal a removal, suspension or discharge. Senate Bill 435 would establish the Learn and Earn Cooperative Education Program between eligible community and technical colleges and participating companies for students enrolled in technical programs. Senate Bill 440 would grant additional authority to county litter control officers, specifically to issue citations for failure to prove lawful disposal of trash and creating, contributing to or allowing an open dump. Senate Bill 446 would create the Neighborhood Housing and Economic Stabilization Program. The bill would authorize the Economic Development Authority to contract with the Housing Development Fund to administer the program.